Homepage. This page: A smart two-seat Austin Seven seen in August 1930, and other examples. 1. Austin Seven "Chummy" . 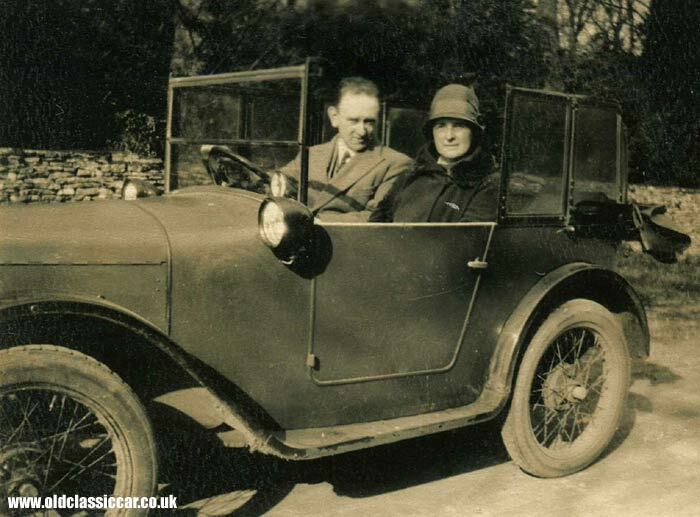 Jeremy kindly agreed to this vintage motoring photo being shown on the site, it shows his Great Uncle Harry in August 1930, sat in a two-seater Austin 7 'Chummy' tourer. He adds: "My Great Aunt and Uncle (and their peers) lived most of their lives in E7, East London. He worked in the Royal Docks and received a commendation for an act of bravery there during the blitz. 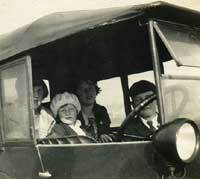 They used to enjoy going out for drives in the countryside. My Uncle was not very adventurous and would not go far, much to my Aunt's annoyance. He always had a full toolkit with him, just in case, and would never drive in the rain, dark or snow." "This could well be Essex, possibly out towards Southend way, or out towards Pinner in Middlesex as they had relatives out that way. But really that is just speculation. 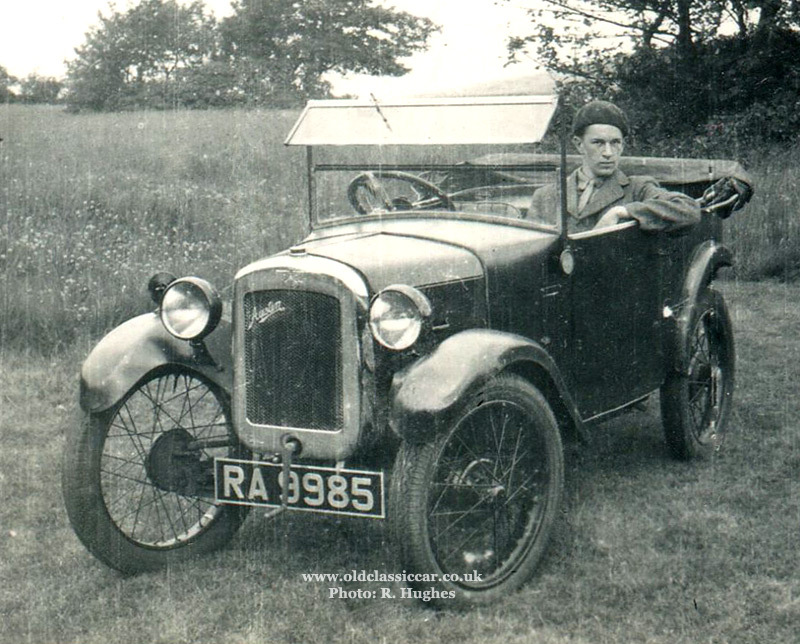 In later life he drove Morris Minors but still wouldn't go far. When he died (late seventies, from what I recall) his Minor (black with red leather that smelled fantastic) was nearly ten years old and only had a few thousand on the clock. How I would have loved that car, but my Aunt sold it". 2. Another Austin 7 Chummy. 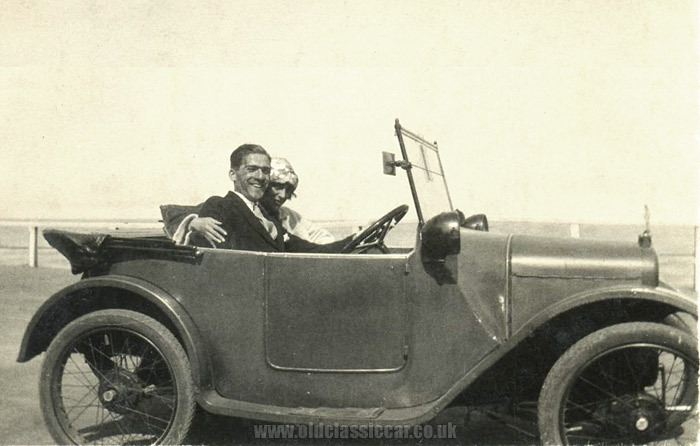 This next shot shows a different couple, ready for a trip out in their Austin 7 Chummy. Again this is an early-ish example, with the scuttle-mounted headlamps. 3. Austin Chummy parked in suburbia. 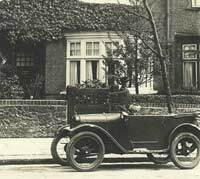 This very atmospheric photograph from the 1920's shows an Austin 7 Chummy, parked outside a smart suburban residence. 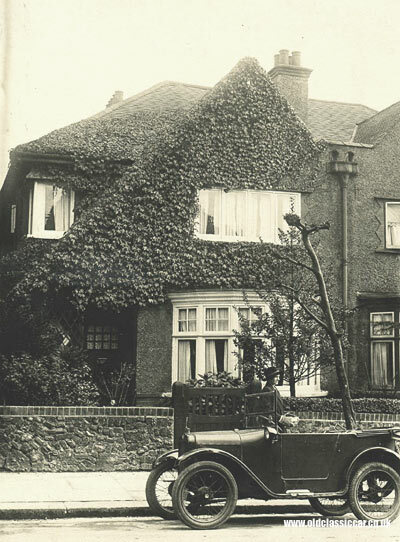 Evidently the home-owner was no fan of pebbledash, as he or she has sought to hide it beneath a generous covering of ivy. In fact, much of the roof is also covered in the stuff - I don't envy anyone ever trying to remove that! Note the lack of television aerial, satellite dish, UPVC window frames and no sign anywhere of plastic guttering. The Austin's roof is lowered yet the lady walking past has thick furry gloves on, so the owner of this little car must have been a hardy type. The tree trunk apparently sticking out of the car's rear seat has had me scratching my head. I don't see how it could have been supported in the car, yet it is shown this side of the brick wall, so my guess is that it had been left to grow through the pavement, and is in fact just behind where the 7 is parked. The road bares evidence of many oily engines being parked above it, no doubt some of it having leaked from the Austin's 747cc engine. 4. Front-on view of an Austin 7. Unfortunately this next photo is a little blurred, but as it features another Austin 7 Chummy I decided to pop it in here. 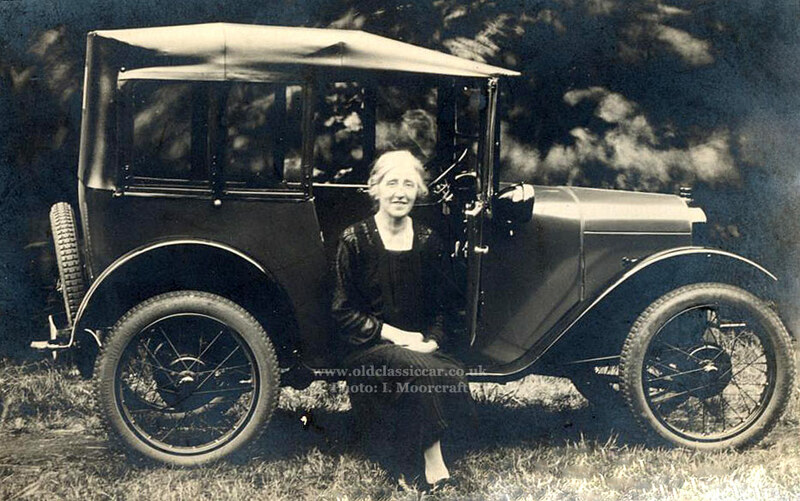 The Austin's registration is FJ 4766, a long-running Exeter series that was introduced in January 1904 and continued for over thirty years, ending finally in August 1934. 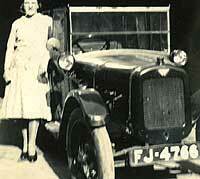 Was the lady stood alongside the Austin the car's new owner? or perhaps the mother of the owner? 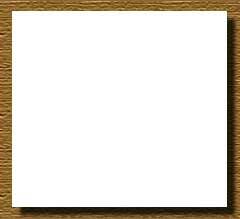 There are no notes with this photograph, so these questions will remain unanswered sadly. The Austin Chummy in this next shot, again an example with the scuttle lamps, has four tiny passengers snuggled up inside waiting for the driver to clamber on board and coax the 747cc engine into life. The girls were named, from the left, Phyllis, Sheila, and Grace, although the lad is simply noted as "Boy" on the rear of the photo. 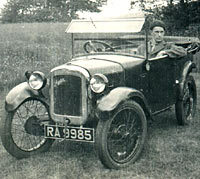 The Austin was "Bertie's car - Baby Austin" and a date of 1931 is given, presumably the date of the photograph. 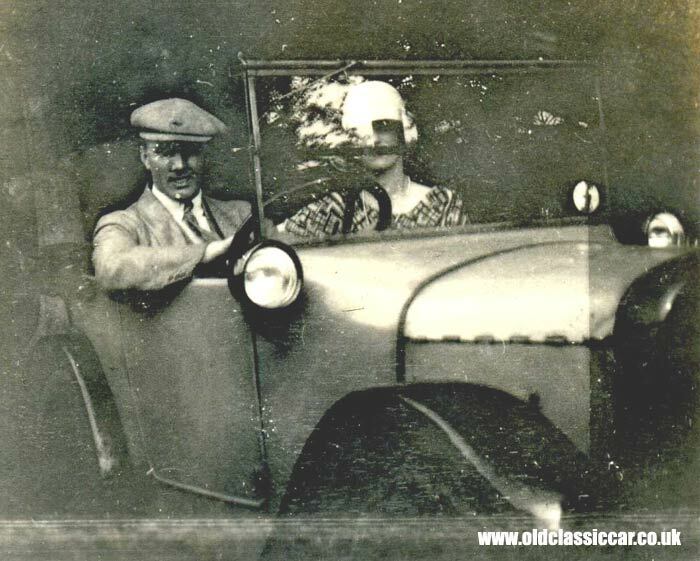 Photograph number six on the Chummy page sees a lady driver (Mary) taking her male companion (Leo) out for a spin in her vintage Chummy. The HL registration hints at an early life in the Wakefield area, the year of this photo being 1930. 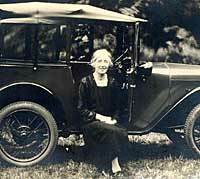 Austin 7s are tiny cars, yet the lady looks dwarfed by the Austin's steering wheel. Does HL 2385 survive? Perhaps in use, converted into a vintage trials car maybe? or lost during the scrap drive of WW2? 7. 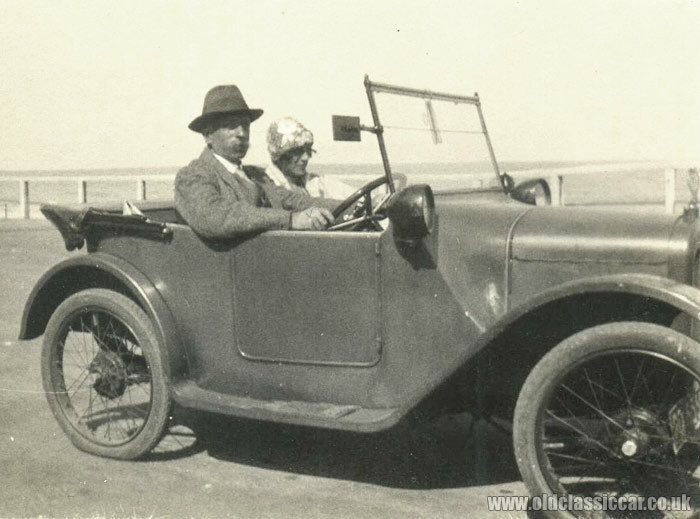 1922 / 1923 Austin 7 Chummy at the seaside. 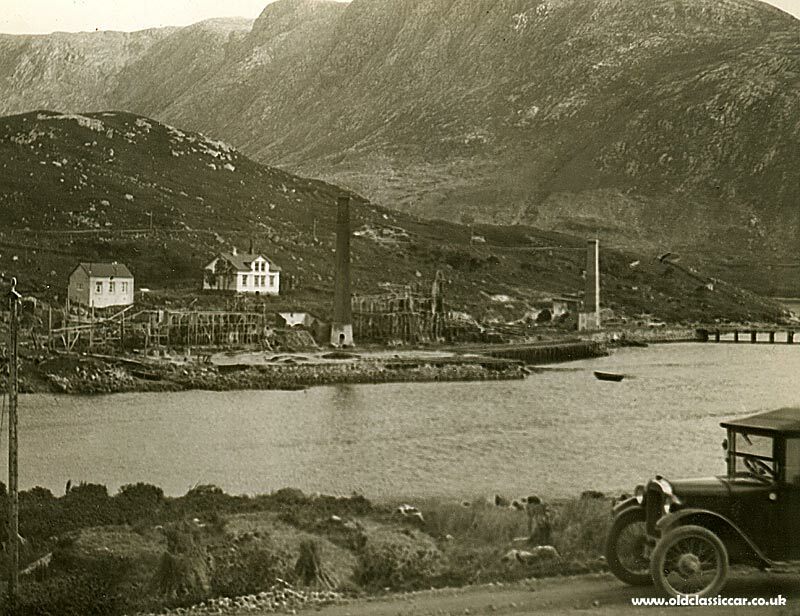 The following trio of vintage photographs feature a very early Austin 7 Chummy parked on a promenade near the sea. Sadly none of the photos reveal the Austin's registration, so the identity of this scuttle-lamp Chummy will remain forever a mystery. Three people are shown in all, each taking a turn behind the camera. 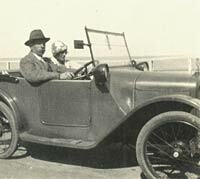 Photograph number 1 in this set shows a chap behind the wheel, with his young lady sat alongside. 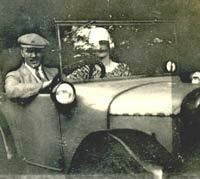 The second photograph shows the lady missing from the scene, replaced by an older gent wearing a hat, and sucking on a pipe. Presumably the lady was responsible for this shot - the only one of the three that actually shows the entire car. 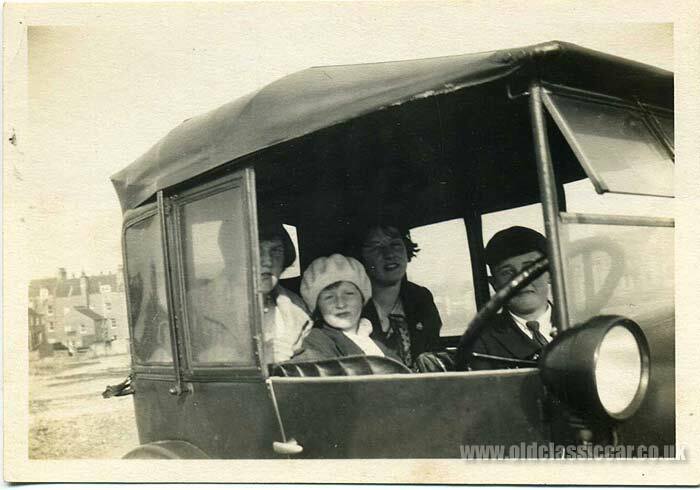 And finally for this set, a front 3/4 view of the Chummy, with the lady back in the passenger seat, and the hatted chap now posed in the driver's seat. An AA badge can just be made out, attached to the Austin's radiator cap. 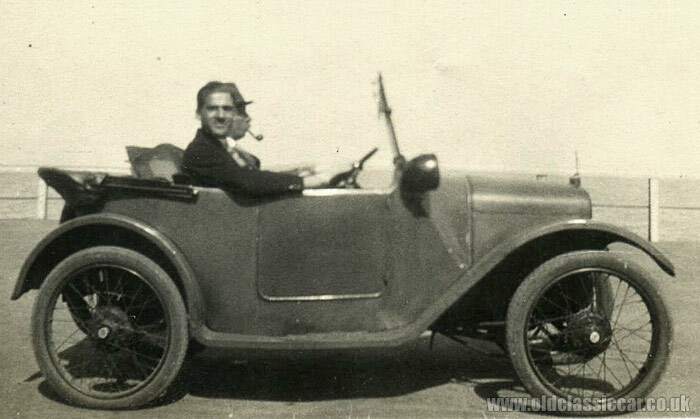 Tony dropped me a line from Australia after I put these photos live on the site, will the following additional information: "The three new pictures of an Austin 'Chummy' by the seaside show a very early car - possibly 1923. 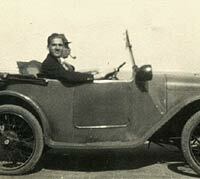 In June 1924 the windscreen was placed vertical, the doors widened and the scoop removed from the scuttle. The brakes are 6" and fitted with Dunlop Cord Tyres (pre well based), a fascinating set of pictures". Tony then added the following information, after showing the photos to a friend of his: "By the headlights, the flat four-blade steering wheel & the front wings, I would say could be late 1922, but if not it's definitely a 1923." Thanks gents. 8. Two people sat in a vintage Austin. The photo below would neither win prizes for artistic merit, nor for the photographer an award for technological prowess behind the lens. 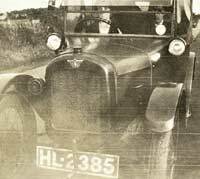 However it is a proper old photograph of an Austin 7 Chummy, printed on Velox paper. 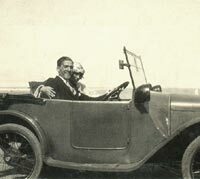 The dapper chap and his glamorous companion are an object lesson in how one should dress while driving a '20s motor-car. The Austin's modest top speed should cause no issues with poorly-secured headgear making a bid for freedom while pootling along. 9. A Chummy parked in a rugged landscape. No information accompanies this photograph sadly. The landscape points to a remote location, possibly in Scotland, but does anyone recognise the location or the workings on the distant shoreline? The Chummy is later than many of those previously shown on this page, in that it has its headlamps mounted alongside the radiator in the conventional manner, rather than on the scuttle. 10. A 1929 Austin Chummy parked in a field. Richard Hughes - a long-term member of the OCC Forum - turned up this small photo at a car boot sale. In it, a smartly-dressed gent (in military attire perhaps?) is shown sat in the passenger seat, looking less-than-overjoyed at the prospect of further travel in Austin's pocket-sized "Chummy". The Austin 7 is a relatively late example of the breed, just like the car shown above. It was registered RA 9985, a Derbyshire series that ran between 1926 and 1929. Austin 7 experts - of which I'm not one - will spot that the nearside running board is absent, and the rear wing has been cutaway at both the forward and rearward ends. Had they rotted away, been damaged, or been removed for another purpose - perhaps to offer extra clearance for a spot of off-road trialling? Thanks for sending the photo over. The following side-on view of a Chummy parked in a suburban setting was sent over some time ago, and was discovered during a house clearance as I recall. It may just be the angle of the photograph, but the Austin has something of a "nose down" attitude in this scene. The ill-fitting bonnet, and the radiator surround, may just be resting loosely in place, temporarily for the photo. The location isn't known. Note the polished scuttle vent evident on this example, a feature that doesn't appear on all the cars shown here. "A real hybrid, very strange. 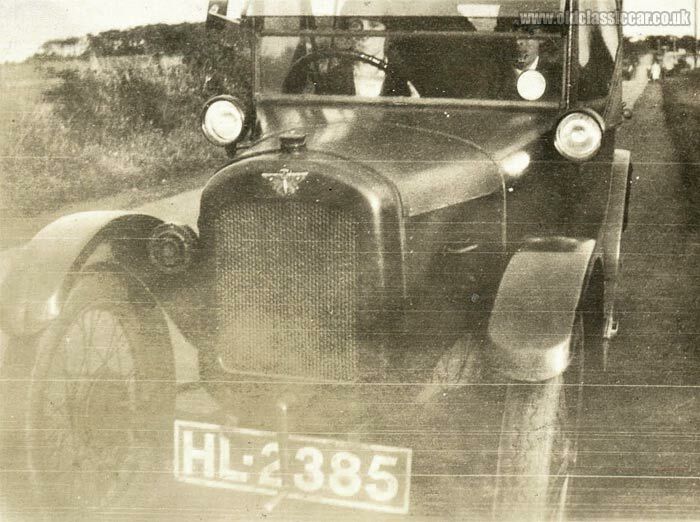 Looks to be a 1929 AD tourer body which would have had a nickel rad shell attached to the previous model's 2" shorter black steel rad, making the bonnet line slope to the front. Leaning back screen went out in about 1924." Ian, who provided the above notes regarding the previous photo, and also a great set of photos showing the Austin-Healey Sprite he owned in the 1960s (link) sent over the following for comparison. "This is a great pic of a 1928 Chummy on an original unused postcard that I bought off eBay a few years ago. 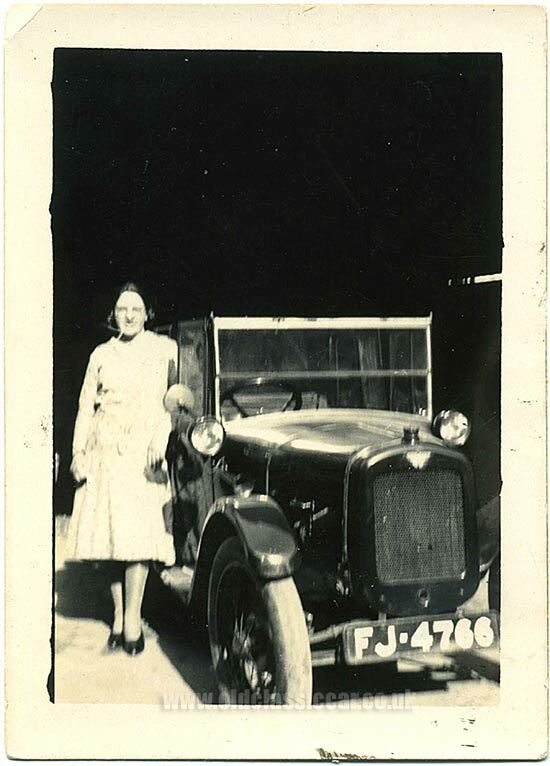 Unfortunately, the only details on the back are "Miss Kitty and her Austin 7" so the registration will never be known." Thanks for the photo Ian. The Chummy looks to be in immaculate, most likely new, condition, fitted with Dunlop Cord tyres. 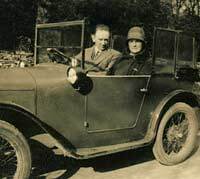 The Austin 7 was introduced in 1922, and until 1926 was available in just the one style - a basic two-door two-seater tourer, as seen here. 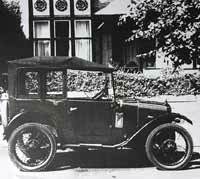 Only then was a saloon version of the Austin 7 offered. The tourer, which evolved through a number of different factory model names as the design changed, soon became known as the Chummy, and this unofficial name stuck. 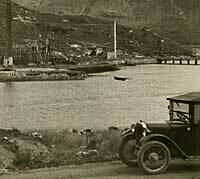 The first cars were the AB Family Model tourers, which in 1924 were replaced by the updated AC series. In 1926 the AD came along, with a curvier scuttle and lower screen curved to suit. In 1928 a nickel-plated radiator shell became standard fitment, which in 1929 was replaced by chrome. The new AE also had a slightly larger body than the previous model, and headlamps mounted on the front wings. 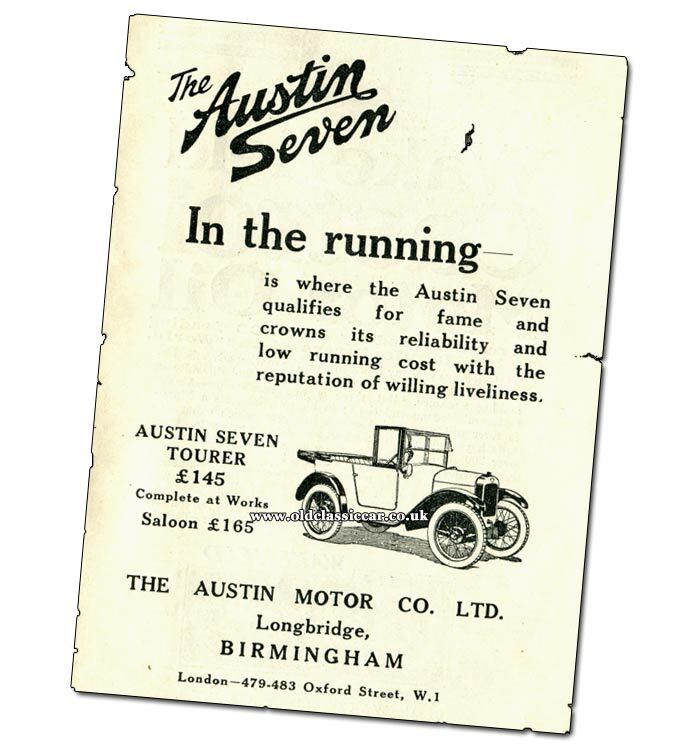 The Austin 7 shown above has a painted rad surround, so is probably an early/mid production AD series tourer. Note how the headlamps were still fitted to the scuttle at this time, rather than ahead of the radiator as on later cars. An advertisement from the 1920s. Shown below is a factory advertisement for a scuttle-lamp Chummy of the 1920s. Brief and to the point, mention of the 7's reliability, low running costs, and its "willing liveliness" and little else - bar the price - are to be found. There's also mention of the saloon version. 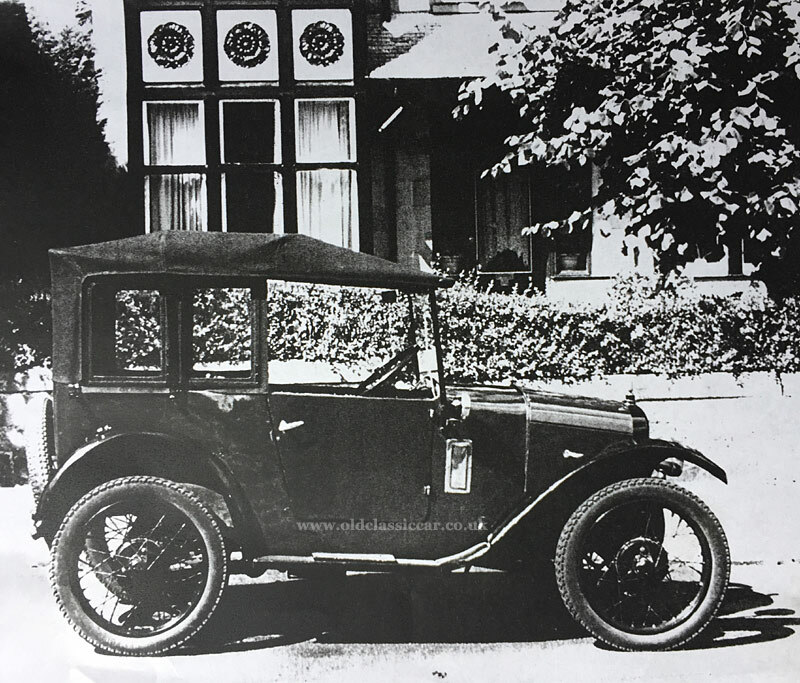 While the Gordon England coachbuilder actually put the first Austin 7 saloons into production, the factory itself introduced their own in September 1926. Headlamps moved from the scuttle to the front wings in about 1929, thus dating this advert at somewhere between late 1926, and 1929. 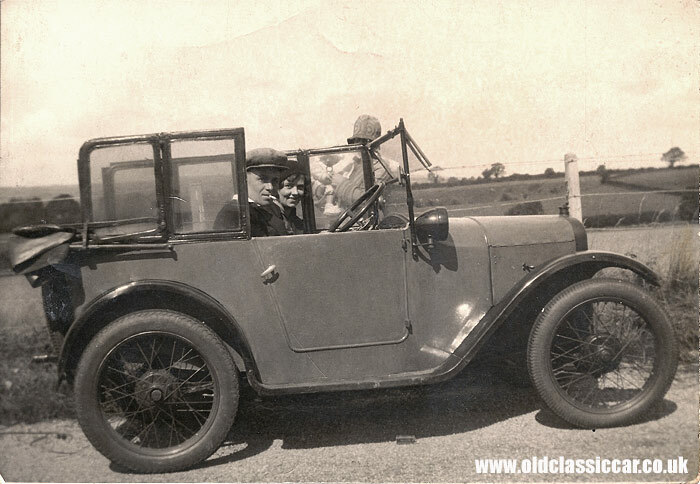 Photographs of the 1932-on PD tourer will be placed on this page of the site.